Being named as Valedictorian or Salutatorian is an exemplary achievement. Cherish your memories with friends and teachers that left a lasting impression. Your speech will captivate your audience so it is important to look your best by wearing one of our Gold Valedictorian Stoles or Gold Salutatorian Stoles. If you need more of a contrast, we have a White Salutatorian Stole and White Valedictorian Stole. 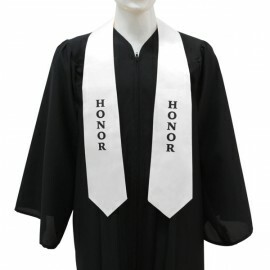 Not only is it announced when you walk across the stage, but for graduates with honors, you are occasionally designated to wear a Gold Honor Stole or possibly a White Honor Stole. Stoles are commonly worn around the graduate’s neck and hang loose in front of them throughout the graduation commencement. Gradshop.com offers stock imprinted stoles in the popular tip style, high quality bridal satin fabric, and they are fully lined. 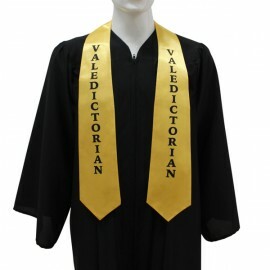 We have tailored to your academic success by offering these imprinted stoles at economical prices. They are crafted with a perfect balance of design, style and sophistication. With our vast selection of stoles, we have it or we can make them in large quantities – we recommend that you view our custom graduation stoles! 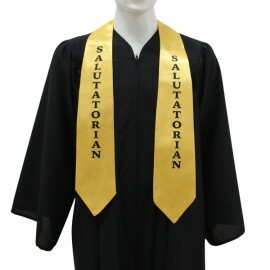 Gradshop's imprinted graduation stoles are certain to be your number one choice. They may be purchased individually or purchased in bulk to receive huge savings. If you’re not sure which stole is right for your graduation, please contact us and one of our graduation specialists will gladly help you find the right stole for your graduation. Call now!